With new technical regulations for the 2017 season of the Deutsche Tourenwagen Meisterschaft, the unveil of the new DTM cars has been eagerly awaited. 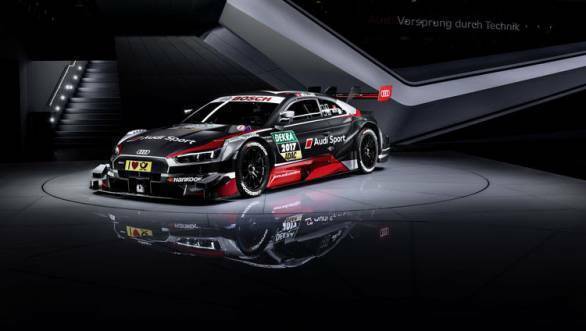 And Audi has become the first manufacturer to unveil their 2017 DTM challenger - the RS 5 DTM. Unveiled at the 2017 Geneva Motor Show, the RS 5 DTM looks more aggressive than its predecessors. The machine's front end has been revised, featuring higher wheel arches, and a single-frame radiator grill. The rear of the car features a wing with two flaps. The top flap is moveable, which helps increase the efficacy of the DRS system. The overall ride height of the car has been reduced, as per the new technical regulations. It is expected that this, in combination with a decrease in aerodynamic downforce, and softer tyres, will ensure that the emphasis on driver performance is much higher. While the 2-litre engines won't make it to the series until 2019, Audi has made changes to the current 4-litre V8 engine. The air intakes have been modified, as has the cooling system, and power goes up from 450PS to 500PS. Six RS 5 DTMs will compete in 2017, piloted by Mattias Ekström, Nico Müller, Loic Duval, Mike Rockenfeller, Rene Rast and Jamie Green. "These are exciting times for the DTM," said Dieter Gass, head of Audi's motorsport division. "We have more power, softer tires and less downforce. Combined with the best drivers, we expect to see even more thrilling racing."